Johnson's provides custom fabrications for residential and commercial central air conditioning and ventilation systems including new or replacement systems, retrofit and duct sealing projects, rooftop duct systems and specialized applications. Johnson’s custom built equipment plenums and platforms are custom designed to fit to any size equipment cabinet and any height requirement. They are fitted with high quality gasketed access doors to expedite access for future service and maintenance or built for use in free-air plenum chambers and mechanical rooms. Duct systems are designed and built to maximize the performance of today’s high efficiency systems and provide years of dependable deliver of balanced air distribution to interior spaces. Johnson’s fiberglass duct systems for residential and commercial buildings are custom built for each application. High performance air delivery is achieved through accurate design, precision fabrication and high standards of installation workmanship. Existing duct systems are often replaced or retrofitted using these techniques to improve the performance of existing systems or in conjunction with a high efficiency system upgrade. Rigid rectangular trunk-lines are less resistant to airflow than systems built primarily from flexible ducts. The fittings used to connect trunk lines and branches deliver air more efficiently than flexible duct systems. 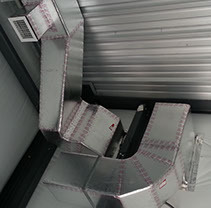 Rigid duct trunk-lines are suspended by metal strap trapeze hangers fitted with duct saddles to protect the edges of the ducts. They are suspended in attics and drop ceiling cavities to provide clearance above structural members, ceiling insulation and fixtures to provide an airtight seal on all sides. Duct systems are fabricated with insulation values appropriate for the location and exposure to heat that the ducts are subject to. Ducts in hot humid attic spaces are built with higher insulation values to prevent sweating and efficiency losses.